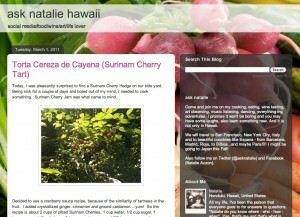 Honolulu foodie Natalie Aczon has been blogging since the start of January 2009. On her site, she writes: “Come and join me on my cooking, eating, wine tasting, art observing, music listening, dancing, everything-ing adventures. I promise it won’t be boring and you may have some laughs, also learn something new.” You can follower her on Twitter at @asknatalie.